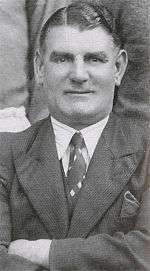 Joseph "Joe" Smith (25 June 1889 – 11 August 1971) was an English professional football player and manager. He is tenth in the list of England's top-flight goal scorers with 243 league goals to his name. He was manager of Blackpool for 23 years and guided them to victory in the 1953 FA Cup Final, the only time they have won the competition since their 1887 inception. Born in Dudley in the West Midlands, after leaving Crewe Alexandra Smith spent almost his entire playing career with Bolton Wanderers, for whom he signed in 1908, either as an inside or centre-forward. Wanderers won the Second Division title in 1908–09, but were immediately relegated out of the First Division in 1909–10. They regained their top-flight status after securing a second-place finish in the Second Division in 1910–11. Smith then became the club's top-scorer in 1911–12 with 24 goals, as Bolton posted a fourth-place finish, six points behind champions Blackburn Rovers. He scored 22 goals in 1912–13, as Bolton dropped to eighth position. George Lillycrop then became the club's leading scorer in 1913–14, before Smith finished as the club's top-scorer for the third time in four seasons with 36 goals in 1914–15. During World War I he guested for Chelsea and Port Vale. ↑ Kent, Jeff (1996). Port Vale Personalities. Witan Books. p. 272. ISBN 0-9529152-0-0. 1 2 Joyce, Michael (2004). 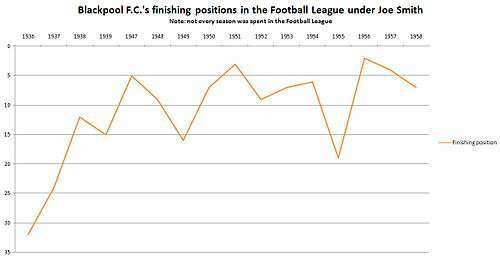 Football League Players' Records 1888–1939. ISBN 1-899468-67-6. ↑ "Match No. 114 – Saturday, 15th February 1913". englandstats.com. Retrieved 16 December 2012. ↑ "Match No. 118 – Monday, 16th March 1914". englandstats.com. Retrieved 16 December 2012. ↑ "Match No. 119 – Tuesday, 14th April 1914". englandstats.com. Retrieved 16 December 2012. ↑ "Match No. 120 – Saturday, 25th October 1919". englandstats.com. Retrieved 16 December 2012. ↑ "Match No. 121 – Monday, 15th March 1920". englandstats.com. Retrieved 16 December 2012.